Tamoanchan was conceived as a paradise where the Gods of the Aztecs created the first of the present human race out of sacrificed blood and ground human stolen from the Underworld of Mictlan. Radio Free Clear Light has re-conceived Tamoanchan, the making place. 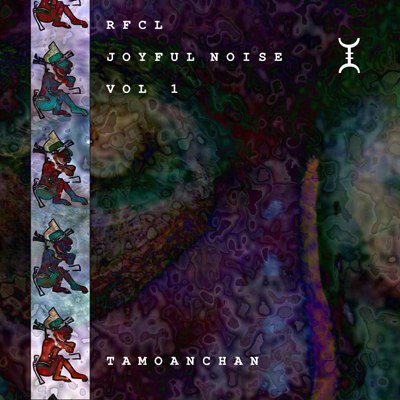 Like the Tzitzimimeh of Tamoanchan, RFCL stole relics from the underworld, loops cut from old songs, bits captured from street corners, passages from under appreciated books, and mixed them with sacrificed blood. Blood is life, therefore anything live would serve as sacrificed blood, and in this case it was live improvisations, the music of the moment given up in devotion to the pure and resplendent act of creation. The new springs from the old and the old lives on, transformed in the new. This thing that you hold in your hands is now a relic, the cold dead remains of something that lived and breathed. Now it is your turn to choose whether or not to mix it with something live; the moment, your awakened attention, a new act of creation. Will you, or will you not raise Tamoanchan once more? Go here for a review on Aural Innovations. Juan Carlos Mendizabal - electronics, mixing, deconstruction.